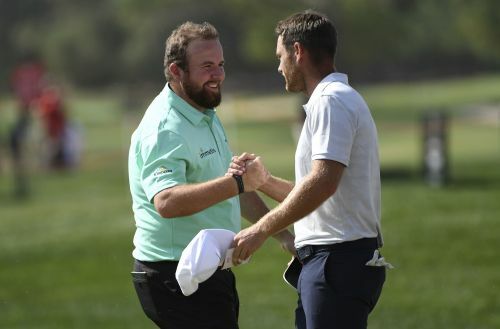 ABU DHABI, United Arab Emirates (AP) — Irish golfer Shane Lowry is looking to reignite his career after losing his card on the PGA Tour last year. Beginning 2019 with a 10-under 62 is pretty much the ideal way to start. Lowry rolled in 10 birdies and did not drop a shot in the first round of the Abu Dhabi Championship on Wednesday, giving him a three-stroke lead in the European Tour's opening event of the year. Down to 75th in the rankings and now 3½ years without a win, Lowry is adjusting to life back as a full-time European Tour player after failing to successfully juggle his commitments on both sides of the Atlantic in 2018. He appears to be reaping the rewards of a lengthy spell of practice in Dubai at the start of the new year after not playing competitively since November. "I feel good about my game," Lowry said after tying the course record at Abu Dhabi Golf Club. "It's probably the best preseason I've ever done." Pablo Larrazabal, the 2014 champion in Abu Dhabi, finished eagle-birdie-birdie to complete a four-way tie for second place at 65 with Louis Oosthuizen, Mike Lorenzo-Vera and Richard Sterne. Three-time winner Martin Kaymer was in a five-man group a further shot back, while second-ranked Brooks Koepka shot a bogey-free 67. Tommy Fleetwood, who is seeking a third straight victory at the year-opening tournament, and No. 3 Dustin Johnson had 69s. Lowry only hit four fairways in his 62, which matched the course record set by Henrik Stenson in the inaugural edition of the event in 2006. It was his iron play that set him apart, an approach to within 2 feet of a pin tucked away at the front of the 18th green — on his ninth hole of the day — possibly his highlight. He bent over in dismay after coming up short with a 20-foot putt at his last hole, failing to get the birdie that would have clinched the lowest round of his career. Instead, it tied the 62 he shot in winning the Irish Open as an amateur in 2009. "I've just gone out with not much expectation but knew I was playing OK," Lowry said, "and yeah, everything clicked." Lowry has faded since winning the WGC Bridgestone Invitational in 2015, which helped lift him to No. 17 in the rankings. He didn't make Europe's last two Ryder Cup teams and, after six missed cuts and not a single top-10 finish, lost his playing privileges in America. While missing the cut at the British Open at Carnoustie last year, he said he was not enjoying his golf but seems to have embraced a return to the European Tour. Lowry's initial aim is to get back into the world's top 50 so he can play in golf's showpiece events in 2019. The appointment of a fellow Irishman — Padraig Harrington — as European captain ahead of the 2020 Ryder Cup has given him another source of motivation.